Mange is a condition that causes hair loss, itching and skin irritation. 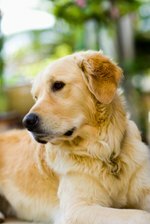 It is caused by mites that burrow into the dog's skin. Mange can make your dog look and feel bad. There are different types of mange, so your dog should be seen by a veterinarian for proper diagnosis, but there are a few ways you can help your pet recover from a bout of mange. 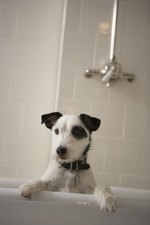 Give your dog a bath to prevent secondary infections and remove dead, flaky skin. Make sure your pet is getting fed often enough and is eating a food that will provide him with the vitamins and nutrients he needs to maintain optimal health. Give your pet vitamin supplements that contain fatty acids. Omega-3 fatty acids can help your dog maintain a healthy coat and skin. Take your dog to the veterinarian for a dip in a medicated solution; she may need more than one treatment depending on the type of mange and severity of the condition. Give him the medication prescribed by the vet, such as antibacterial or anti-fungal drugs or something to calm the itching. Wash bedding and other items the dog has been in contact with in your washer's hottest cycle.